AHLA guidebook for healthcare providers, consultants, and attorneys, it describes the broad spectrum of laws and legal theories, as well as the Fraud and Abuse principles used by government enforcement. 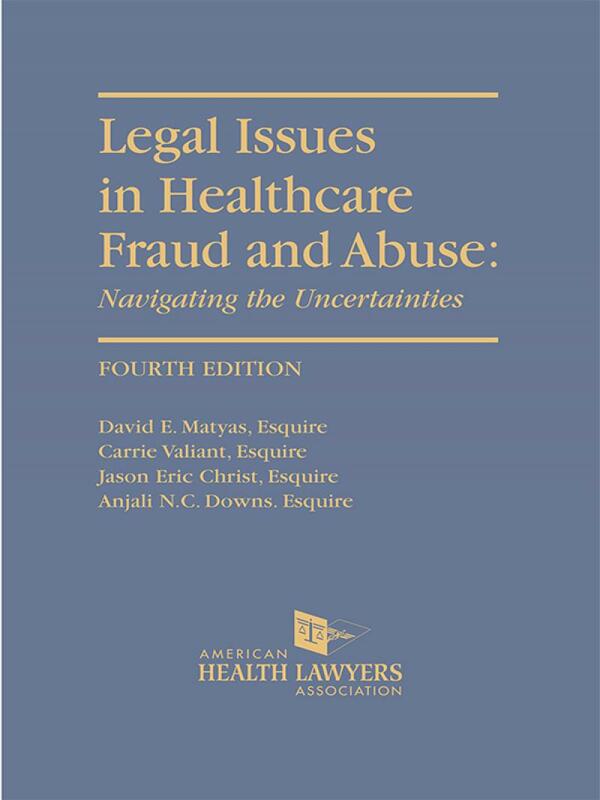 Legal Issues in Healthcare Fraud and Abuse: Navigating the Uncertainties, Fourth Edition with 2015 Cumulative Supplement is a guidebook for healthcare providers, consultants, and attorneys, and describes the broad spectrum of laws and legal theories, as well as the principles used by the government to enforce its drive against fraud in the healthcare arena. The book begins with a thorough review of governmental enforcement entities, including the Department of Justice, the Department of Health and Human Services(and its affiliated subgroups like the Office of Inspector General, and Centers for Medicare & Medicaid Services), as well as other federal agencies, state governments, and private payers. The authors review all of the major laws and activities that are the subject of healthcare fraud investigations, and spend considerable time addressing the major statutory elements in each. These include the anti-kickback statute, the federal physician self-referral prohibitions (as well as the applicable safe harbors), the false claims act, and the administrative sanctions that are available to the enforcers. They also provide an overview of state counterparts to the federal laws addressing self-referrals, anti-kickback issues, false claims, other statutory authorities, and private initiatives. 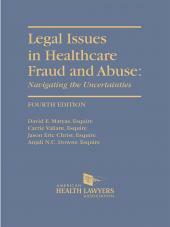 In addition, the authors address two important areas in healthcare fraud: corporate compliance efforts and managed care. They note the tremendous growth in the managed care segment of the industry and the challenge in enforcement efforts due to the subtle and complicated nature of fraud in this setting. They identify some of the differences between fraud in the fee-for-service and managed care settings, such as denial of appropriate care, inadequate treatment, and inflation of reporting numbers of patients treated. Finally, the authors discuss some of the important issues that confront attorneys practicing in the subspecialty of healthcare fraud, and take a look into the crystal ball for potential legislative activities and anticipated enforcement efforts in the remainder of the 21st century. As the nation’s largest, nonpartisan, nonprofit organization devoted to legal issues in the health care field, the American Health Lawyers Association (AHLA) leads in providing just-in-time education, establishing trusted resources, and encouraging robust dialogue among its members and the greater health law community. With nearly 14,000 members, AHLA boasts deep expertise among practitioners who represent clients across the entire health care industry spectrum. As a result, AHLA resources benefit not only attorneys, but also anyone who advises physicians, hospitals, health systems, specialty providers, payers, life sciences companies, and many other health care stakeholders. If you have an interest in health law, you have a home in AHLA. 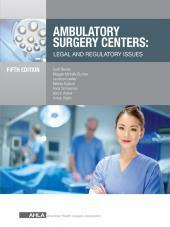 For more information about the education and resources of AHLA, please visit us at www.healthlawyers.org. David E. Matyas is a member of Epstein Becker & Green's Health Care and Life Sciences practice in the firm's Washington, D.C., office. Mr. Matyas represents and defends healthcare entities in connection with government audits and investigations; helps clients develop, implement and evaluate healthcare corporate compliance programs; counsels clients in planning and structuring transactions and business arrangements to minimize fraud and abuse and understand reimbursement implications in matters related to healthcare transactions; and advises clients on legal and regulatory matters in connection with investment documents, offering memoranda, filings with the SEC and other transactional documents. Mr. Matyas represents an array of healthcare providers including hospitals and health systems, pharmaceutical and medical device manufacturers, academic medical centers, retail and specialty pharmacies, ambulatory surgery centers, home health agencies, and physician organizations. He also advises investors and other financial institutions that invest in or support the healthcare industry. From 2005 to 2008, Mr. Matyas had been appointed by the Secretary of the Department of Health & Human Services to the Advisory Committee on Blood Safety & Availability, which provides advice on broad public health, ethical and legal issues related to the nation's supply of blood and blood products. From 2002 to 2008, Mr. Matyas served as a member of the Board of Directors for the American Health Lawyers Association. In 2005 and in 2010, Mr. Matyas was selected by the editors of Nightingale's Healthcare News as one of the "Outstanding Fraud & Compliance Lawyers." Mr. Matyas is also listed in the District of Columbia Healthcare category of Chambers USA, The Best Lawyers in America, and in Washington, D.C., Super Lawyers magazine. Jason Eric Christ is an attorney in Epstein Becker & Green's Health Care and Life Sciences group who focuses his practice on representing clients in the healthcare industry in state and federal investigations and litigation pertaining to the healthcare fraud and abuse laws. Specifically he defends clients in civil and criminal matters involving various state and federal false claim laws, Stark Law, the Anti-kickback Statute, and the federal Health Care Fraud statute. On behalf of his clients, Mr. Christ responds to audits, subpoenas, Civil Investigative Demands and letter requests from fraud enforcement entities including government and government contractors and shepherds all phases of such investigations through final resolution. He also assists clients with complex electronic discovery involving electronic medical records and proprietary Health IT systems and counsel clients on document retention and data preservation practices. Additionally, Mr. Christ provides health regulatory counseling to a variety of entities including hospitals, urgent care centers, physician groups, pharmacies, manufacturers, suppliers, insurers, skilled nursing facilities, and medical professional staffing organizations. Mr. Christ received his law degree with honors from the University of Maryland School of Law. While in law school, he earned University of Maryland's concentration in healthcare law and served as managing editor of the Journal of Health Law & Policy. For his undergraduate degree, he attended the Pennsylvania State University and the American University in Cairo and received his B.A. with distinction. Mr. Christ writes, speaks and publishes on matters involving the healthcare fraud and abuse laws and electronic discovery and currently serves is a member of the adjunct faculty at the American University Washington College of Law's Health Law and Policy Institute. He is admitted to practice in the District of Columbia, Maryland and the U.S. District Court for the District of Columbia. Anjali N.C. Downs is a partner of Epstein Becker Green’s Health Care and Life Sciences Practice in the firm’s Washington, D.C., office. She practices in the firm’s Health Care Fraud Practice Group, which focuses on federal and state fraud issues, including anti-kickback, self-referral, false claims, secondary payer issues, and false billings. Ms. Downs represents a variety of health care and life science organizations including health systems, pharmaceutical and medical device manufacturers, pharmacies, clinical laboratories, academic medical centers, physician group practices, dialysis providers, and medical transportation providers.Ms. Downs’ experiences include conducting internal health regulatory investigations; assisting clients in preparing self-disclosures and advisory opinion requests; representing and defending health care entities undergoing government investigations, inquiries and audits; assisting clients in developing, implementing, and evaluating corporate compliance programs; and advising clients on physician contracting arrangements in a variety of health care joint ventures. In 2017, Ms. Downs was selected to the Washington DC Rising Stars list in the area of Health Care. Chapter 1 — The Fraud Enforcers-- Who Are They and What Do They Do?